However as a writer, it’s “Stuck in Love” that truly hits home, centering on a celebrated author (Greg Kinnear) and his daughter and son (Lily Collins and Nat Wolff) who appear destined to follow in his footsteps. The two have plenty of material to draw on from their parents’ divorce and surviving college and high school, yet the film doesn’t follow the predictable path of exploring teen angst so much as it delves into what happens when creative types try to escape the narrative they’ve carefully constructed for themselves, whether it’s Kinnear’s Faulkner Award-winning William who can’t stop himself from peering into the window of his nearby ex-wife (Jennifer Connelly), Wolff’s unconfident Rusty who’s further shaken when he attracts the attention of a popular girl with a troubled past (Liana Liberato) or Collins’ Samantha whose overconfidence prevents her from pursuing a relationship with a likeminded classmate (Logan Lerman). Light and charming on the surface, but unexpectedly complex underneath, it truly is a book that can’t be judged by its cover and recently Boone took the time to talk about how the idea percolated from the time when he himself was in high school, what Greg Kinnear and Jennifer Connelly brought to the table and what the past 12 months have been like. From what I’ve read, it wasn’t until you wrote something personal that you were able to get much traction. Did you actually feel that was the case? No, that was totally the case. I don’t think the other scripts weren’t good. I was able to attach some pretty substantial actors to some of the earlier scripts that I did — Mark Ruffalo was attached to one — which gave me the perseverance to keep going. But I think it was being able to write something autobiographical that gave me the ability to sit in a room with somebody who could give me the money to make the movie and convince them I was the best person to make it. I had written a sci-fi movie [called “Parallel”] and a historical, political ’90s Oliver Stone-type movie [called “The Atomic Age,” the Ruffalo film which traced a 50-year history of nuclear weapons] and it’s like I couldn’t make a case that I was the best person to direct those. Writing those scripts was like trial and error to figure out what I could actually get made as a first movie. Over the ten years I was out in L.A. just struggling and working at a record store and writing script after script, it was just figuring out how to make a first movie. [Creating] an ensemble [piece] was very helpful from a casting standpoint in being able to get people to come in because nobody felt like it was all on their shoulders. Being able to tell personal stories to those actors and open my life up to them helped get them invested in the film. One of my favorite ideas in the film is that you can picture what kind of books the three family members that are writers would actually write based on the way they insert their literary voice into the way they speak. Was that something that was difficult to convey in a film? I hope [that’s the case] and the books that I put in their world were books that I felt those characters would read. Like Greg’s character very much seemed like he read John Cheever and Richard Ford and John Updike and Raymond Carver and wanted to be one of those serious novelists whereas Nat Wolff was absolutely me in high school. I was obsessed with Stephen King, probably since I was eight years old. I didn’t think that much about [the connection between what they wrote and how they spoke], it just happened so organically. The very first scene in the movie where Rusty is looking at Kate in the high school classroom, I wrote that first page in high school. I pulled it out years and years later after I had written all those scripts that almost got made and didn’t and [thought], What am I going to do? Am I going to move back home? I don’t know how I’m going to make this work. I just decided to I was going to write this from my heart and sincerely write something about what happened to me when I was younger — things that I still had questions about or I was wondering about. I just took all those elements and put them in a blender. One of the more intriguing aspects of the movie is seeing how the children are shaped by the parents’ more permissive attitudes towards raising them, yet you’ve said in the past that you grew up in a pretty strict religious household. Was it interesting to imagine growing up that way? It’s maybe more how I imagined I would be as a parent. I’ve had a daughter since I made the movie and it’s like I don’t know if it would be, but I I always loved Cameron Crowe movies. They’re so earnest and heartfelt and I loved Ione Skye’s relationship with her father in “Say Anything.” I [also] just like interesting parent-child dynamics, so I thought there are ways that they could be more open with each other than I was with my parents. What was it like being on the set of your first film and seeing what the actors bring to it? Never in my life did I think I would get the cast that I got. Jennifer Connelly is somebody that I’ve idolized for years as an actress and I had like a bulletin board in my room when I was in high school that I put all the actors in stills from movies that I loved and I’d look up at it when I wrote. Jack Nicholson — all those movies he made in the ’70s, my dad had on Beta, and I remember watching “Five Easy Pieces” and “One Flew Over the Cuckoo’s Nest” — was up on that board and she was up on that board too. It’s pretty close to what I had in my head [originally], but the actors brought so much to the table. In the original script, Jennifer’s character never went to the book party at the end, but Jennifer was like what if she did? I wrote a new version of the script for her and that’s when she committed to the movie. Greg, too, goes and meets Jennifer in a coffee shop [scene] and gives that speech to her about how he’s a better rewriter. That was all Greg Kinnear. I wrote the dialogue, but he had that idea. “Stuck in Love” demonstrates an obvious admiration for writers and your next film is adaptation of John Green’s “The Fault in Our Stars.” Though it was scripted by Scott Neustadter and Michael Weber (“The Spectacular Now”), has it been interesting to interpret someone else’s work? I still can’t believe they are letting me make that movie, but Fox, the studio that did it, and John Green, who wrote the book really liked [“Stuck in Love”] and liked my take on the material, so I hope I can do it justice. The script was done before I ever came onboard, but [Scott and Michael are] such good writers and John was so happy with the script that I think fans will be really happy. It’s very true to the novel. Then as soon as I’m done with “Fault in Our Stars,” I’m going to make another movie with Judy Cairo, who produced “Stuck in Love,” called “Pretenders” with Michael B. Jordan from “Fruitvale Station,” Imogen Poots and Anton Yelchin. When you struggle for so many years and have a moment like you’re having now, what’s that like? You just pinch yourself every day. I was on the Fox lot a couple weeks ago and i just remember walking around being like I can’t believe I’m actually getting to do what I dreamed that I wanted to do when I was eight years old. (laughs) I just can’t believe it. I still wonder if I’m in “The Matrix.” I’m just going to keep trying to make good movies and hope they keep letting me make them. 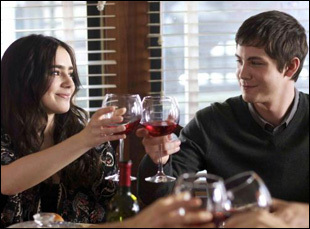 “Stuck in Love” opens on July 5th at the Sunshine Cinema in New York and will open later this month in Los Angeles. Interview: Jimmy Loweree on Filling a Void with the Horror/Sci-Fi Thriller "Absence"